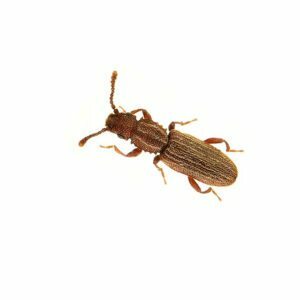 Measuring only 1/8th of an inch, the sawtoothed grain beetle can squeeze through small cracks and crevices and contaminate food products. Adults can’t fly and are not attracted to light. The presence of sawtoothed grain beetles in food products is the main objection, but the damage and contamination of a product cannot be ignored. Its flat body allows it to maneuver through small cracks and into imperfectly sealed packages. 1/8 inch (2.5-3 millimeters) long. Adults measure 1/8 inch (2.5-3 millimeters) long with a flattened body. Brown with six saw-like teeth on each side of prothorax. Food products containing some food oils such as grain products, pasta, candy bars, and mixes (e.g., pancake mix, cookie mix, etc.). Females lay 45-285 white, shiny eggs singly or in small clusters in crevices of food within two to five months. Depending on the temperature, eggs can hatch within three to 17 days. Life cycle is 30 to 50 days with six to seven generations per year. Adults generally live six to 10 months, but can live for more than three years. The small size and very flat body of the sawtoothed grain beetle allows it to hide in very small cracks and enter unopened packages. Therefore, with the exception of fumigation, most treatments may not affect a sawtoothed grain beetle infestation if it is in a well-protected place.